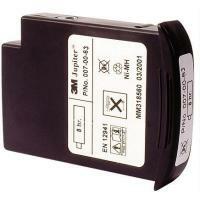 3M Jupiter Battery Pack - 4 Hour Intrinsically Safe with Pouch Kit. (Not illustrated) 085-12-00P Code 200419. Note: A Jupiter Turbo Unit that has been used in a dust environment without an Intrinsically Safe pouch fitted should never be used for Intrinsically Safe applications. 4 hr battery = 5.2V NiMH rechargeable. Nickel Metal Hydride batteries provide longer duration for less weight. The battery must be charged in a safe area. 3M Jupiter™ Air Filter Intrinsically Safe Turbo Unit - Particulates, gases and vapours. 085-00-10P. Code 276802 Classified EExibIIBT3II2GD. The 3M Jupiter™ , when used with one of the 3M approved head tops, forms a power-assisted respiratory protection device.